Our friendly sales team will answer your calls or emails regarding our materials, sizes, prices and freight fees. Once you place your order, we will invoice you. We will proceed to pack your item once the invoice has been paid. Your parcel will include certificates and a copy of the invoice with a receipt of payment. Airport Metals (Australia)’s main business is the supply of metals to aircraft manufacturers and operators. Metals used in the manufacture and maintenance of aircraft must necessarily be strong and light and come from highly reliable sources. Since material stocked by us must be suitable, without compromise, for direct application on aircraft, it therefore comes only from the best mill sources and is supplied with test documentation to prove that it complies with the highest applicable standards. Our aluminium 2024, 6061, 7075 is available in sheet, plate, rod, bar, tube and extrusions. We are also stockists of bronze rod and welding wire for aerospace and industrial applications. Sheets and plates can be cut to size using our band saw or our guillotine services. All our products come with AS9120A and ISO 9001:2008 certifications of distributor of aircraft metals and cargo loading systems for narrow body aircraft. Other aircraft materials that ideally cross over to race car use include aluminium tube, aluminium sheet, aluminium plate, titanium sheet, streamline tube (also known as aerofoil, aerotube, and teardrop tube) in both aluminium and 4130, and solid bar and rod sections in aluminium, 4130 chrome moly and titanium. Carbon steel CDS ASTM A513 electric-resistance-welded carbon and alloy steel mechanical tubing (ERW-DOM) covers carbon and alloy steel mechanical tube manufactured by cold forming and electric resistance welding of hot-rolled or cold-rolled strip. In this case, type 5, covers welded and drawn-over- mandrel (DOM) tube, which has closer OD/ID/wall tolerances than ERW products. DOM usually is supplied in 1020 or 1026 grade. Cold Drawn Seamless Carbon Steel (CDS) is a more economical alternative product and is widely used for roll cage manufacture in automotive, appliance and construction industries where cost is the priority. Chrome moly tube is widely used in race and rally cars for chassis, roll cage and suspension component manufacture. 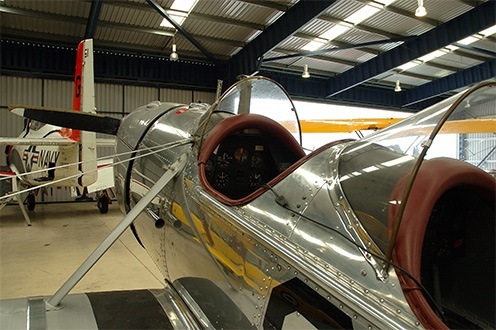 Originally popular for aircraft structural frames, chrome moly tube is still widely used in light aircraft for engine mountings and undercarriage components. The “chrome” and “moly” refer to the small percentages of chromium and molybdenum added to steel to give strength and hard wearing characteristics. The most common chrome moly alloy type is 4130, which provides an excellent compromise between strength and ease of welding. There is a frequent misconception that 4130 tube is lighter than mild steel tube; 4130 actually weighs about the same as mild steel, but because it is considerably stronger, weight savings can be achieved by using smaller sections of it. Airport Metals (Australia) stocks a wide range of sizes of aircraft grade seamless 4130 tube, which we only source from top quality North American or European mills. Chrome moly sheet is similarly used where strength and hard wearing is needed with minimum weight penalty. Applications range from sump guards and floors to suspension and chassis brackets. Chrome moly tube ends and welding rod. It makes no sense to mix high strength 4130 material with lower strength end fittings and weld filler.